Ever since my partner Tobie introduced to me to the newer board games and such, I've been amazed with how far things have come. Some truly novel and creative games had been developed over the years resulting in diverse game experiences and a lot of good memories with friends. But some of the best games don't need to be the most complicated ones either. Sure, it's fun to lug around big game boxes and setup complex boards across a table. But then you come across truly brilliant games that fit in the sleeve of your bag or even your pocket. Fluxx is a game that's simple to learn but tricky to win and yet conveniently portable. At it's simplest, it's a card game and thus its portability. But more than that it's a completely different mindset when it comes to such tabletop games and one that excels with seemingly so little. One can explain the basic rules of the game in two short sentences. But then no two Fluxx games are ever the same - hence all the craziness that comes with it. 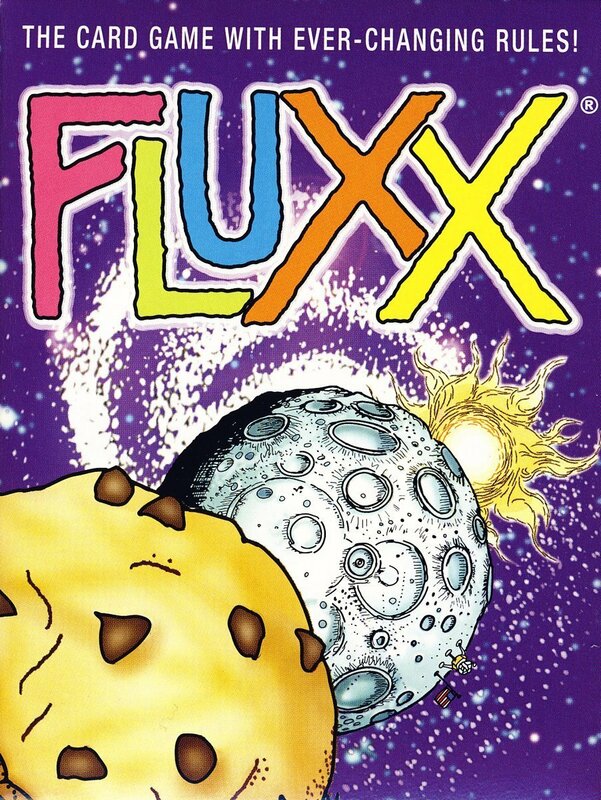 Fluxx is a card game for 2-6 players created by Andrew Looney. It's tagline is that it is "The Card Game With Ever-Changing Rules!" - and it truly lives up to this name. When it comes to new players, all I need to tell them is this: "Draw one. Play one." Those are the most basic rules of the game. But what is the objective? How does one win a game of Fluxx? We'll find out during the course of the game itself. Your basic Fluxx deck has several types of cards. At first everyone will have limited options given they have to follow the basic rules - draw one card from the deck and play one card from the deck. However the deck includes New Rules, which include manipulating how many cards are drawn or played or even how many cards you can have in hand. In order to win, you need to meet the condition/s of whichever goal card/s is/are in play at the moment. Since goals are also cards, any player can introduce a new goal, thus changing things up. And there are slightly more complex Action cards that have you do different things like drawing a second hand of cards to manipulate or gives all players a new card to work with. Meeting goals is simple enough - most of them involve having certain Keeper cards in play. And keepers are seemingly random items like a Rocket or an Eye. But they gain meaning when you look at the goal cards like the need to have the Keeper cards for Milk and Cookies to achieve, well, Milk and Cookies. But there are also annoying cards call Creepers which you have to play when you draw them and typically they prevent you from winning. But there are still Goal cards that actually require Creeper cards, so things can get pretty interesting. Thus the game is pretty easy to learn at its most basic level, but at times actually winning can seem like almost random affair. But the strategy of the game really comes into play when you try to figure out how to make the most of the cards that you have in your hand right now. It's a game that requires quick thinking and tests how well you can come up with a plan with only so many cards in hand and of course a limited number of cards that you can actually play. Fluxx games can be very quick when a lucky player has the right number of Keepers in play early on. But they can also drag on for a significant period of time, especially when New Rules like Hand Limit 0 or Play All get involved. Being forced to play every single card that you have can get pretty tiring, but even then it's still possible to salvage victory - it'll probably just take you a while. Fluxx is a nice little gateway game that is great in terms of introducing new players to the wider range of tabletop games out there beyond the likes of Snakes & Ladders or Monopoly. And it's a game with many different themed expansion sets like the futuristic Star Fluxx and the undead Zombie Fluxx to name a few. Thus Fluxx even just as a base game scores a solid 5 crazy Action cards out of a possible 5.